Son of Godzilla (怪獣島の決戦 ゴジラの息子, Kaijū-tō no Kessen: Gojira no Musuko, lit. 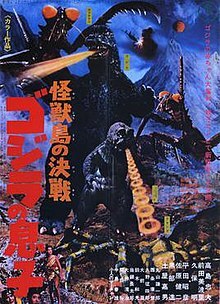 Monster Island's Decisive Battle: Son of Godzilla) is a 1967 Japanese science fiction kaiju film featuring Godzilla, produced and distributed by Toho. The film is directed by Jun Fukuda with special effects by Sadamasa Arikawa with supervision by Eiji Tsuburaya and stars Tadao Takashima, Akira Kubo, Akihiko Hirata, and Beverly Maeda, with Hiroshi Sekita, Seiji Onaka, and Haruo Nakajima as Godzilla and Marchan the Dwarf as Minilla. The film was released in Japan on December 16, 1967 and released directly to television in the United States in 1969 through the Walter Reade Organization. A team of scientists are trying to perfect a weather-controlling system. Their efforts are hampered by the arrival of a nosy reporter and by the sudden presence of 2-meter tall giant praying mantises. The first test of the weather control system goes awry when the remote control for a radioactive balloon is jammed by an unexplained signal coming from the center of the island. The balloon detonates prematurely, creating a radioactive storm that causes the giant mantises to grow to enormous sizes. Investigating the mantises, which are named Kamacuras (Gimantis in the English-dubbed version), the scientists find the monstrous insects digging an egg out from under a pile of earth. The egg hatches, revealing a baby Godzilla. The scientists realize that the baby's telepathic cries for help were the cause of the interference that ruined their experiment. Shortly afterwards, Godzilla arrives on the island in response to the infant's cries, demolishing the scientist's base while rushing to defend the baby. Godzilla kills two of the Kamacuras during the battle while one manages to fly away to safety, Godzilla then adopts the baby. The baby Godzilla, named Minilla, quickly grows to about half the size of the adult Godzilla and Godzilla instructs it on the important monster skills of roaring and using its atomic ray. At first, Minilla has difficulty producing anything more than atomic smoke rings, but Godzilla discovers that stressful conditions (i.e. stomping on his tail) or motivation produces a true radioactive blast. Minilla comes to the aid of Saeko when she is attacked by a Kamacuras, but inadvertently awakens Kumonga (Spiga in the English-dubbed version), a giant spider that was sleeping in a valley. Kumonga attacks the caves where the scientists are hiding and Minilla stumbles into the fray. Kumonga traps Minilla and the final Kamacuras with its webbing, but as Kumonga begins to feed on the deceased Kamacuras, Godzilla arrives. Godzilla saves Minilla and they work together to defeat Kumonga by using their atomic rays on the giant spider. Hoping to keep the monsters from interfering in their attempt to escape the island, the scientists finally use their perfected weather altering device on the island and the once tropical island becomes buried in snow and ice. As the scientists are saved by an American submarine, Godzilla and Minilla begin to hibernate as they wait for the island to become tropical again. Sadamasa Arikawa gives instructions to Marchan the Dwarf (Minilla). "Marchan the Dwarf" was hired to play the character partially for his ability to perform athletic rolls and flips inside the thick rubber suit. For the second Godzilla film in a row, Toho produced an island themed adventure with a smaller budget than most of their monster films from this time period. While the a-list crew of talent was hired to work on that year's King Kong Escapes, (Ishirō Honda, Eiji Tsuburaya, and Akira Ifukube), the second string crew of cheaper talent was once again tapped to work on this project as they had done with Ebirah, Horror of the Deep. This included Jun Fukuda (director), Sadamasa Arikawa (special effects), and Masaru Sato (composer). This was the first film where Arikawa was officially listed as the director of Special Effects, although he did receive some supervision from Tsuburaya when he was available. Toho wanted to create a baby Godzilla to appeal to the "date crowd" (a genre of films that were very popular among young couples during this time period), with the idea that girls would like a "cute" baby monster. For the idea behind Minilla, Fukuda stated, "We wanted to take a new approach, so we gave Godzilla a child. We thought it would be a little strange if we gave Godzilla a daughter, so instead we gave him a son". Fukuda also wanted to portray the monsters almost as people in regards to the father-son relationship between Godzilla and Minilla, as Fukuda stated "We focused on the relationship between Godzilla and his son throughout the course of Son of Godzilla. Minilla was designed to incorporate features of not only a baby Godzilla but a human baby was well. "Marchan the Dwarf" was hired to play the character due to his ability to play-act and to give the character a childlike ambiance. He was also hired because of his ability to perform athletic rolls and flips inside the thick rubber suit. The Godzilla suit built for this film was the biggest in terms of size and girth. This was done in order to give Godzilla a "maternal" appearance and to give a parent-like stature in contrast next to Minilla. Because of the size of the suit, seasoned Godzilla suit actor Haruo Nakajima was only hired to play Godzilla in two scenes because the suit was much too big for him to wear. The smaller suit he had worn for the films Ebirah, Horror of the Deep and Invasion of Astro-Monster was used for these sequences. The much larger Seji Onaka instead played Godzilla in the film, although he was replaced midway through filming by Hiroshi Sekita after he broke his fingers. Outside of the two monster suits, various marionettes and puppets were used to portray the Island's gigantic inhabitants. The various giant preying mantises known as Kamacuras and the huge poisonous spider Kumonga. Arikawa would usually have 20 puppeteers at a time working on the various marionettes. The massive Kumonga puppet needed 2 to 3 people at a time to operate each leg. Son of Godzilla was distributed theatrically in Japan by Toho on December 16, 1967. Son of Godzilla was never released theatrically in the United States. The film was released directly to television by Walter Reade Sterling as well as American International Pictures (AIP-TV) in some markets in 1969. The American television version was cut to 84 minutes. In 2005, the film was released on DVD by Sony Pictures in its original uncut length with the original Japanese audio and Toho's international English dub. ^ a b c d e Galbraith IV 2008, p. 244. ^ a b c d e f g Galbraith IV 2008, p. 245. ^ Ragone 2007, p. 169. ^ a b c d Ryfle 1998, p. 143. ^ a b Ryfle 1998, p. 357. ^ Kabushiki 1993, p. 62. ^ a b Kabushiki 1993, p. 63. ^ Ragone, August; Eggleton, Bob (2014). "The Complete Godzilla Chronology 1954-2004". Famous Monsters of Filmland. No. 274. Movieland Classics LLC. p. 23. ^ a b Ryfle 1998, p. 141. ^ Godziszewski, Ed (1979). "Twenty-five Years with Godzilla". Fangoria. No. 1. O'Quinn Studios Inc. p. 38. ^ a b c Kabushiki 1993, p. 64. ^ Kaneko & Nakajima 1983, p. 101. ^ Ryfle 1998, p. 142. ^ Kaneko & Nakajima 1983, p. 76. ^ Kaneko & Nakajima 1983, p. 77. Rhoads & McCorkle, Sean & Brooke (2018). Japan's Green Monsters: Environmental Commentary in Kaiju Cinema. McFarland. ISBN 9781476663906. Kabushiki, Gaisha (1993). ゴジラ・デイズ―ゴジラ映画40年史 (in Japanese). Shueisha. ISBN 4087810917. Kaneko, Masumi; Nakajima, Shinsuke (1983). グラフブックゴジラ (テレビマガジンデラックス 22) (in Japanese). Kondansya Publishing. ISBN 4-06-172472-X. Ragone, August (2007). Eiji Tsuburaya: Master of Monsters. Chronicle Books. ISBN 978-0-8118-6078-9. Ryfle, Steve (1998). Japan's Favorite Mon-star: The Unauthorized Biography of "The Big G". ECW Press. ISBN 9781550223484. "怪獣島の決戦 ゴジラの息子 (Kaijū-tō no Kessen Gojira no Musuko)" (in Japanese). Japanese Movie Database. Retrieved 2007-07-17.